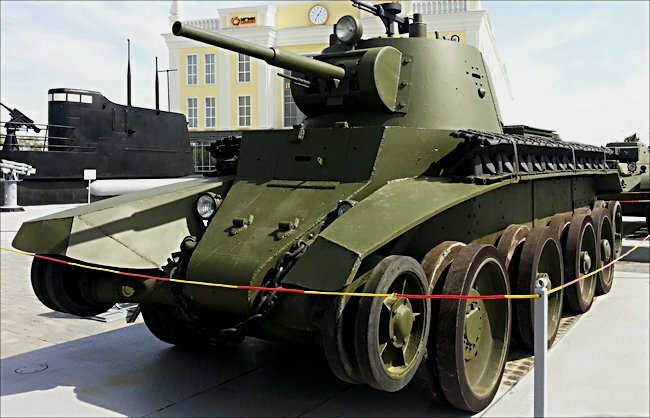 Soviet WW2 BT-7M 1939 Tank ready for driving on the road. Its tracks are safely stored above the mud guards. Notice the sloping armour. The Soviet army armoured doctrine before the outbreak of WW2 was to have two types of tanks. One that would stay with the infantry and offer them support and a faster tank that could exploit any break-through in enemy defensive lines. This followed the British way of thinking. They had slow heavily armoured infantry tanks like the Matilda Tank but they also had lighter, faster Cruiser tanks. In the 1930’s the Russian are using a British designed tanks and tankettes made by Vickers. They have the T26 tank to support the infantry. That was also designed by the British firm Vickers. Their first ‘Cruiser’ tank was the BT. This stood for Bystrokhodny tank, high speed tank. Varints of the BT tank would see active service until the end of WW2. 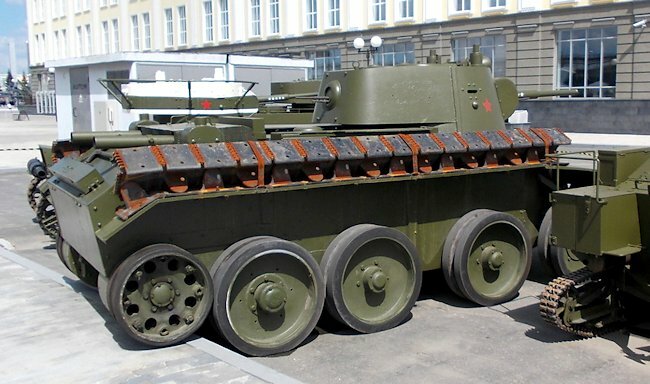 This BT-7M 1939 Tank's tracks are safely stored above the mud guards. It started life in 1930. It was a clever piece of theft of ideas by the Russians. They had purchased two American built Christie Corporation tanks. America at that time did not recognise the USSR so it had to be shipped out clandestinely. The export paperwork said that they were agricultural tractors. They liked the big wheeled tracked Christie suspension system that would appear on many Soviet tanks in the future. It allowed an armoured vehicle to travel over rough open ground at a fast speed. The Russians started to produce copies of the American tank adding a few development ideas of their own. It became the design foundation for all soviet tanks during World War Two. If you look at the side of a Russian BT tank you can see how similar it looks to the later T34/76 tank. Russian designers at the Kharkov Komintern Locomotive Plant (KhPZ) came up with the plans for the BT tank. It had a three man crew and mounted a 45mm gun. It had two 76.2mm machine guns and 22mm of armour plate on the front of the tank. It was powered by a V12 liquid cooled aero engine that was capable of 500bhp. It had a fast road speed of 44.2mph (73km/h). By 1937 Russia had more tanks than the west. Unlike modern tanks the BT tank crews could remove the tank tracks for long road journeys and just drive on the rubber edged wheels. When they got to a battlefield location it only took 30 minutes to refit the tracks. A number of T26 and BT 5 tanks were sent to Spain in 1936 to help the Republicans during the Spanish Civil war. It was here that Russian tanks first engaged German Panzers. The experience of operating tanks in Spain convinced Soviet commanders that they were too thinly armoured. The BT 5 tank’s 45mm gun could easily knock out any Italian or German tank they encountered. After the disastrous invasion of Finland, where they encountered heavy resistance, the BT 7 tanks had their armour upgraded and the engine changed to a diesel power plant that did not catch fire as easily as a petrol one. This variant was called the BT 7M but often called the BT 8. It entered service in 1938. This was the tank that faced the German Panzers during their invasion of Russia during operation Barbarossa. It could easily deal with their Panzer I and II light tanks. It had a fight on its hands, on roughly equal terms, when it fought the Czech built Panzer 38(t), Panzer III and IV tanks. 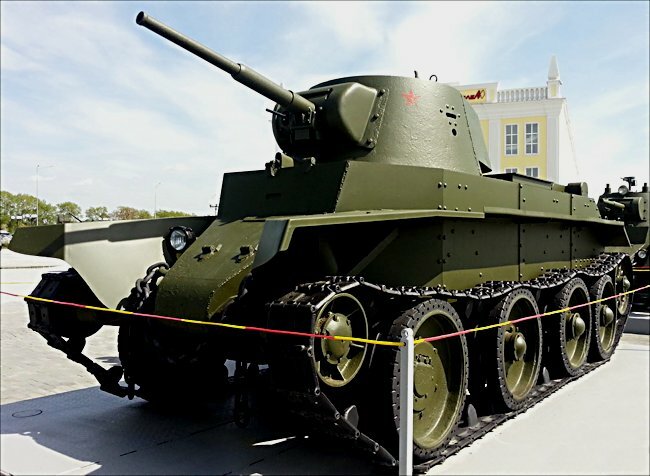 The BT 7 was succeeded by the very successful T34 series of tanks. BT-7 Model 1937 - new turret with sloping armour. BT-7TU - command version, with whip antenna instead of earlier frame antenna. BT-7A -artillery support version with 76.2 mm howitzer and 7.62mm DT machine gun also on the turret rear, 155 exemplars made. OP-7 - flame-thrower version with external fuel panniers (prototype only). BT-SW-2 Cherepakha turtle - another prototype which took the armour sloping to an extreme. BT-7M - 1938, prototypes designated A-8; sometimes referred to as BT-8. New V-2 diesel engine replacing earlier gasoline engines, three DT machine guns: coaxial, in P-40 AA mount on roof and in a ball-mount on turret rear.